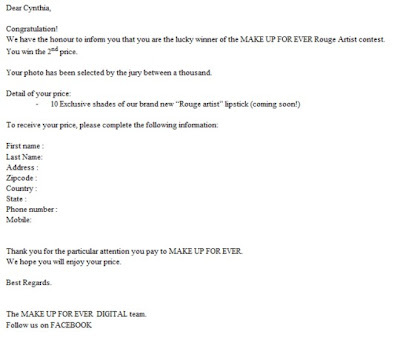 Thank You to all of you who wished me luck, commented &'liked' my photo in the MUFE Facebook Fanpage. I really really appreciate it. Hey !! Congrats !! i knew you'l win !! love the eye makeup btw !! cn u do a tutorial ??? Congrats! and looking fwd to ur videos. and yur hairstyle rocks dude!! Congrats hun!! I knew you're gonna make it. Second thing your hairstyle with volume is gorgeous. Hey Cynthia....Congrats!!!!!!!!!! well deserving win!!!! CONGRATULATIONS! that photo was really b beautiful! the hairstyle is so feminine and flirty. Congrats. 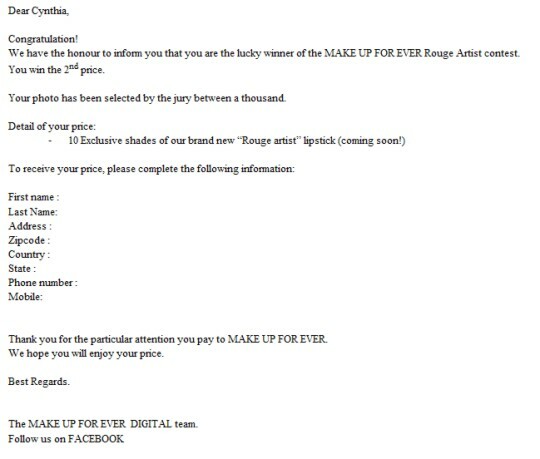 Sorry have been totally out of action in the blogging thing but i visited makeupandbeautyblog (the original one, lol) and was so happy to see you among the winners.